451. Edmond (Edward)8 Allgood (Phillip7, Edmund6, Edward5, William4 Algood, Edward3 Allgood, William2, Edward1 Algood) was born in Sebree, Meade Co. KY July 1845. Edmond died December 13, 1920 in Perry Townshiip, Monroe Co., IN. He married twice. He married Mary Adams in Washington Co., IN. Mary was born Mach 6, 1847 in Washington Co., IN. Mary died November 14, 1889 in Bloomington, Monroe Co., IN. He married Lillie Frances Tilllman March 16, 1894 in Bloomington, Monroe Co., IN. Lillie was born December 1870 in TN. Lillie died March 7, 1905 in Indianapolis, Marion Co., Indiana. 1942 i. John A.9 Allgood was born August 17, 1869. 1943 ii. Rufus Allgood was born in Washington Co., IN July 9, 1870. Rufus died June 14, 1949 in Bloomington, Monroe Co., IN. He married Martha Adeline (Addie) Hendricks November 11, 1893 in Monroe Co., IN. Martha was born Septembe 1874 in Bloomington, Monroe Co., IN. 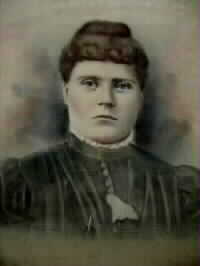 Martha was the daughter of Gabriel A Hendricks and Mary Jane Cutright. Martha died June 29, 1959 in Bloomington, Monroe Co., IN. 1944 iii. Alice Dora Allgood was born July 16, 1872. 1945 iv. Dovey (Dovie) E. Allgood was born April 22,1874. 1946 v. Charles Thomas Allgood was born September 21, 1877. 1947 vi. Eva L. Allgood was born September 4, 1880. 1948 vii. Ora (Orie) Allgood was born July 28, 1883. 1949 viii. Elizabeth (Lizzie) Allgood was born May 26, 1886.